BEDFORD, Pa. - Artie Fink, Jr. and Anthony DeGol took a three-shot lead into the second round of the 29th Pennsylvania Four-Ball Championship and followed that with a score of 67 to cruise to the win in the event at the Bedford Springs Resort. Fink and DeGol shot a two-round total of 129 (-15) to win the championship, which is presented by LECOM. "It's one thing to play with the lead in a golf tournament," DeGol said. "Normally you're trying to play defensive but this format is one where everyone is going to make birdies so it's a tough balance." DeGol noted his own past struggles at the top of the leaderboard made the win even sweeter. "I haven't had the best track record with leads or in final groups so it felt really, really good to hit some shots and make some putts and get in the clubhouse," said DeGol, a 28-year old from Scotch Valley Country Club. For Sinking Valley Country Club's Fink, the win marked his second time as the champion of the event, and in the process, he put his name on a pretty good piece of trivia. Fink teamed with Greg Ferguson to win the Four-Ball in 1999, nearly 20 years ago. 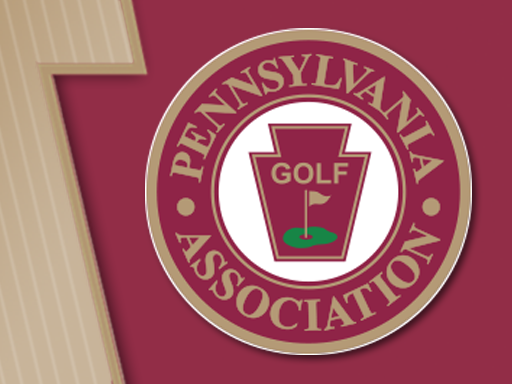 That ties the legendary R. Jay Sigel for the longest gap in winning the same Pennsylvania Golf Association championship, as Sigel won the Pennsylvania Amateur in 1962 and 1981, among other years. After Monday's bogey-free round of 62, the duo started Tuesday on a slower note. Fink couldn't convert his par on the 2nd hole, so despite DeGol's opening birdie, they were back to even par. Then on No. 7, DeGol rolled in another birdie yet the team followed it up with another bogey. However, DeGol made his third birdie of the front side on No. 9 and the team made the turn in the lead. On the back side, the key was hole No. 13, a par 5 where DeGol made eagle. Fink rolled in his lone birdie of the day on No. 16, and from there the overall result was inevitable at the classic Donald Ross design. "That putt Artie made on 16 for birdie really put it away, in my opinion," DeGol said. DeGol made another birdie on the 18th hole for good measure, and the team finished an astounding 15-under par for the championship. Finishing in second place was the duo of Ryan Franks (Valley Brook Country Club) and Mitch Mercer (Shannopin Country Club), who shot a second round 65 for a two-round score of 11-under par. Four teams tied for third place at 10-under par: Jimmy Ellis (Hickory Heights Golf Club) and Nathan Smith (Pinecrest Country Club), Cody Kersey (Pine Meadows Golf Complex) and Jim Gardner (PAGA Individual Member), Mike Manci and Anthony Sebastianelli (Huntsville Golf Club) and Eric Williams (Honesdale Golf Club) and James Gardas (Glenmaura National Golf Club). The Pennsylvania Golf Association would like to thank the staff and membership of the Bedford Springs Resort for their hospitality in the hosting of the championship.